The two candidates for president of Associated Students traded jabs at a debate last Tuesday, as candidates for senate, vice president and president all gathered in the Student Center to pitch their visions for Sonoma State University to a room full of potential voters. As the Associated Students elections wrap up today, the debate stands out as the main event in the campaign because it was a chance to see all of the candidates in one place. A discussion of the merits of each candidate replaced the campaign posters and flyers. The debate between the AS president candidates, Emily Hinton and Wilson Hall, showed each person’s priorities for Sonoma State. Hall clearly saw ways Hinton could have improved her presidency, and, in veiled jabs, said Hinton was not visible enough to the students. “There is a major disconnect between students and their representatives,” Hall said. Hinton chose to focus on her experience. She listed several accomplishments from her first term as president. Among those were establishing a new food policy, lowering the housing deposit and advocating for the Undocumented Resource Center. Her proudest accomplishment was changing the culture at Sonoma State; she said she refocused the values of the university alongside Judy K. Sakaki. When the topic of the tuition increase came up, Hall questioned Hinton’s communication with the students. He said students were “in the dark,” and that Associated Students was not transparent enough. Hinton countered by saying she sent an email to every student, something she just got the ability to do, to let them know about the tuition increase. Hall didn’t seem to think an email was enough. “Taking physical action is something the next AS president should do,” he said. During his campaign, he has seen that when you go up to a random student and ask them about the tuition increase, they don’t know about it. She added that the position is not just about informing students but advocating for them, too. She then mentioned her lobbying efforts in Sacramento to resist the tuition increase. On the topic of diversity, both students had constructive ideas. “We should go to where diversity is,” Hall said. Hall wants to recruit from diverse high schools and believes having someone with an ethnic background will attract diversity. Hinton saw diversity as something “we tend to shove into The HUB.” The HUB is an on-campus center for diversity and inclusivity. To emphasize diversity more, she wants to increase HUB staff and create additional resource centers that specialize in specific groups. During the debate, Branden Woodring, a sophomore business major, asked a question that led to a back and forth about transparency. He asked for proof of the accomplishments of both candidates. “Wilson didn’t know exactly how to get what he’s done out there,” he said. This was is in reference to when Hinton asked the audience to check OrgSync, an online database used by Associated Students, to see if candidates were “making tangible effects.” Hinton was critical of Hall’s participation and attendance in Associated Students. Before the AS president debate, the three candidates for executive vice president debated. The candidates were Briana Taggart, an Associated Students representative, Jason Gorelick, a peer mentor and William-Cruz Martinez, a transfer student who worked in student government at Napa Valley College. 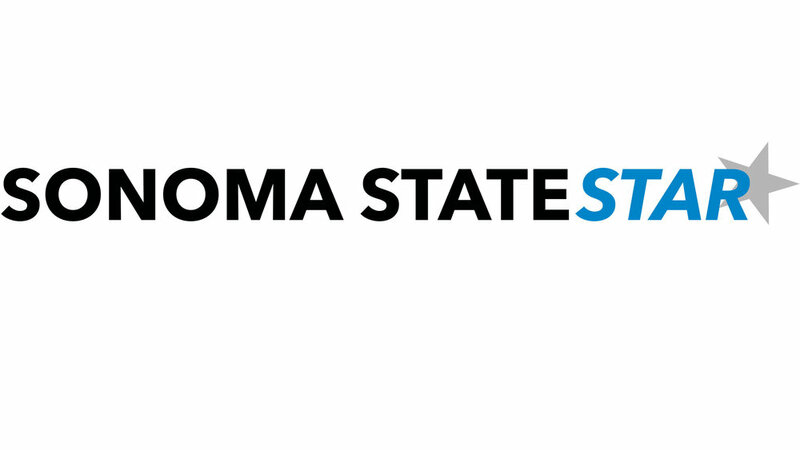 Each candidate proposed new ideas for Sonoma State, as well as what they would focus on as vice president. Taggart, a sophomore, said shewould focus on improving the graduation rate by offering more classes. She also proposed ideas such as replacing the current dorms with traditional style dorms to lower cost and build community. She wants to make course syllabi available prior to registration. Gorelick, also a sophomore, displayed his passion for helping students, talking about how he spends his free time helping the freshmen he mentors. Martinez, a transfer student and former president of Napa Valley College, wants to see more student involvement. He thinks students should attend AS meetings. He also wants to make clubs more popular, because when he transferred he noticed students weren’t as engaged as he hoped. “I would love to bring housing for fraternities and sororities,” he said.